Hi everyone! My name is Michelle and I am Linda’s youngest sister. 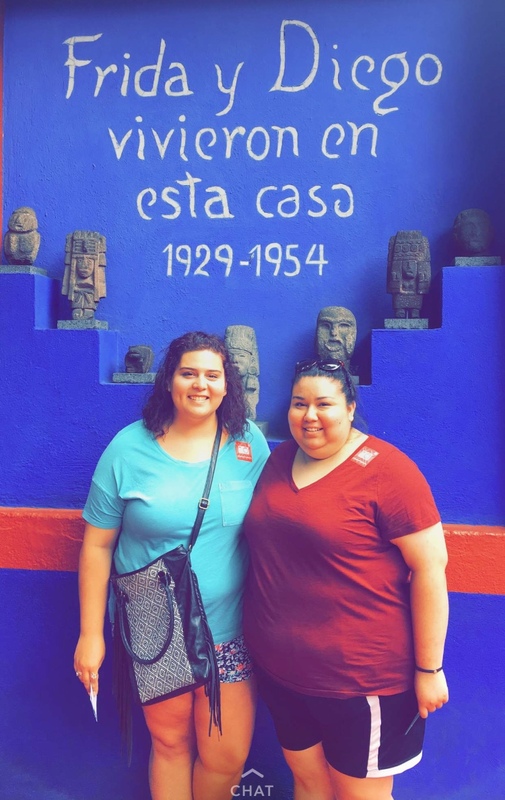 I am a Spanish teacher in East Texas and this summer I was able to go on vacation with my best friend Raquel who is also a Spanish Teacher. We decided to travel to Mexico City in August for about a week. Jarrett has asked me to write about my trip, so here it goes! We arrived in Mexico City at about 10 am on Tuesday. On our way to the airbnb is when we first noticed the crazy amount of traffic that is found in Mexico City. Once we dropped off our bags, we went to a coffee shop that a friend wanted us to try. I did not have the coffee, but my friend seemed to greatly enjoy it. After this we decided to get some groceries in order to be able to eat at home and save some money, I mean we are on a teacher's budget after all. This was THE LONGEST grocery trip EVER! It took us about an hour and a half to get to a Walmart because the Traffic was insane! It wasn’t even that far away! We decided to have tacos for dinner because we’re in Mexico City and of course you have to have tacos! On Wednesday, we decided to go to downtown Mexico, but there was a protest going on and we opted not to go for safety reasons. 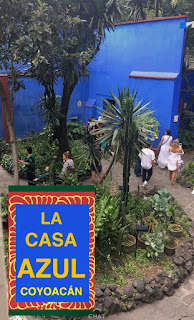 So, we headed to Frida Kahlo’s home in Coyoacan. Now before you head there, I would recommend that you purchase your tickets ahead of time online, otherwise be prepared to wait for a while. They only allow about 40 people per group to enter the house. The prices vary, but if you have either a student or teacher ID you can get a discount, but you still have to pay extra in order take pictures inside. There is art by Frida all over the house and quotes that were said by Frida. Their kitchen had their names on the walls and doves as well. I couldn’t tell what that was made of since we couldn’t actually go into the kitchen. Frida’s studio area looked as if she had just left for a day and let us in her home. Some of her brushes were out, her wheelchair was in front of a canvas. There was a special exhibit of Frida’s most famous dresses and jewelry. We went in and there they were, the most iconic outfits as seen as in pictures, painting, and articles. Even some of back braces and cast were on display. I am so thankful that I got to see it. That night, we went to dinner with my cousin Jorge who lives in the City. 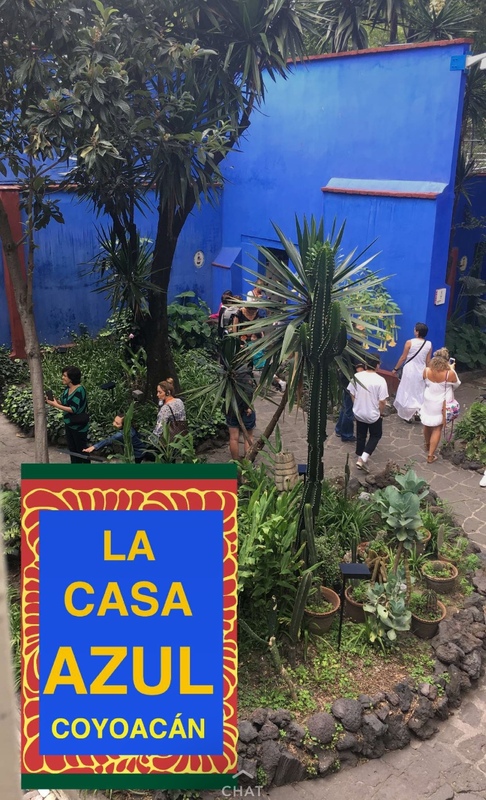 We went to a restaurant called La Casa de Tono that is well known for their pozole. I had it, and I’m not normally a pozole person, but this one was delicious! 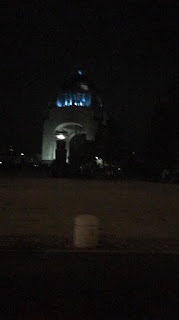 After dinner, we went to the statue of the Angel de la Independencia. Apparently, it’s light is different every night. While there we learned that the statue had fallen once during an earthquake and after that, it was put on a higher level not only because of the earthquake but also because the city is sinking. After that, we just walked around for a bit before we parted ways. The next day we visited the anthropology museum. I’m a giant anthropology geek so this was my favorite! The museum is quite big but the entrance fee is fairly cheap. It was about $70 pesos which ends up being about $6 dollars. The museum is huge and they have so many great exhibits that I would recommend any of them. 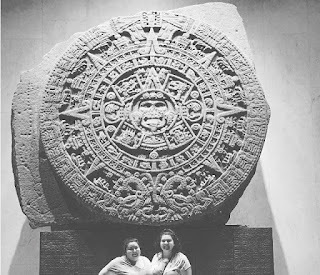 Since we were in a bit of a time crunch, we stuck to the first-floor exhibits which focused on early civilization and Mayan exhibits. Each exhibit was carefully thought out and very beautiful. 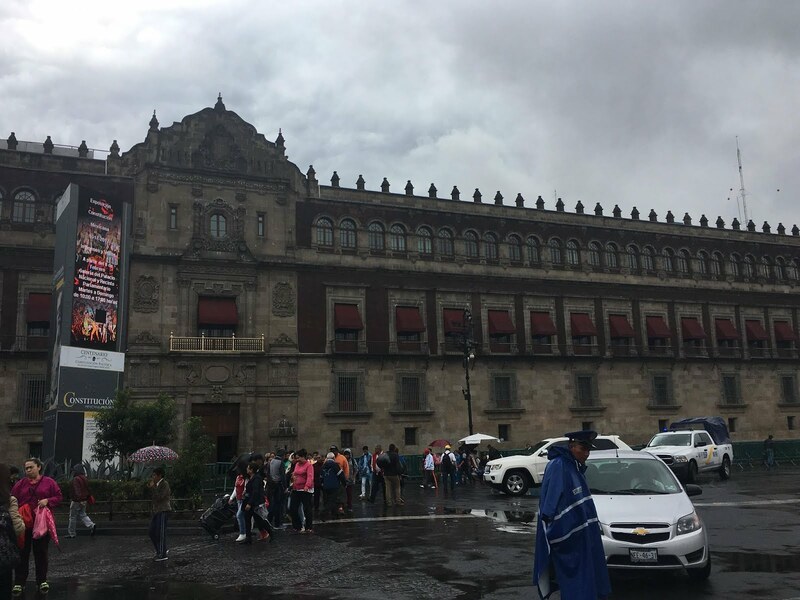 After the museum, we went to downtown Mexico, also known as “El Zocalo.” We saw the balcony where the president of Mexico stands during “El Grito de Dolores” on the night of September 15, beginning the festivities for the 16 of September, Mexico’s Independence Day! We were able to see the ruins of “El Templo Mayor” this temple was one of the most important one for the Aztecs and was located in their capital of Tenochtitlan, which is present-day Mexico. This place was also very affordable only $70 pesos as well! You are allowed to walk on the pathways they have for people but you are not allowed to go into the ruins. The museum is fairly small but still very informative and beautiful. On Friday, we spent our day with God and La Virgin de Guadalupe. 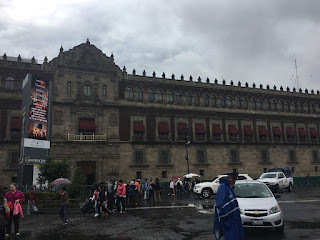 We traveled to “La Basilica de Guadalupe” where we saw the old church that you can tell is sinking and tilting, but inside it is so mesmerizing. We waited in line to get some gifts baptized in holy water. I got a rosary for my mom, a keychain for my dad, and a bracelet for me. Nothing for Linda and Denisse, because they’re heathens. We then watched a ceremony of all women dance and worship the Virgin. It was so cool. We made our way into the new Basilica and sat down to take everything in. You could feel the peace in there. It was wonderful. On Saturday August 12, it was my birthday!! I turned 23 and all I wanted to do was visit the pyramids of Teotihuacán. So, we woke up early in the morning and drove there. It took us about 2 hours to get there because of construction. 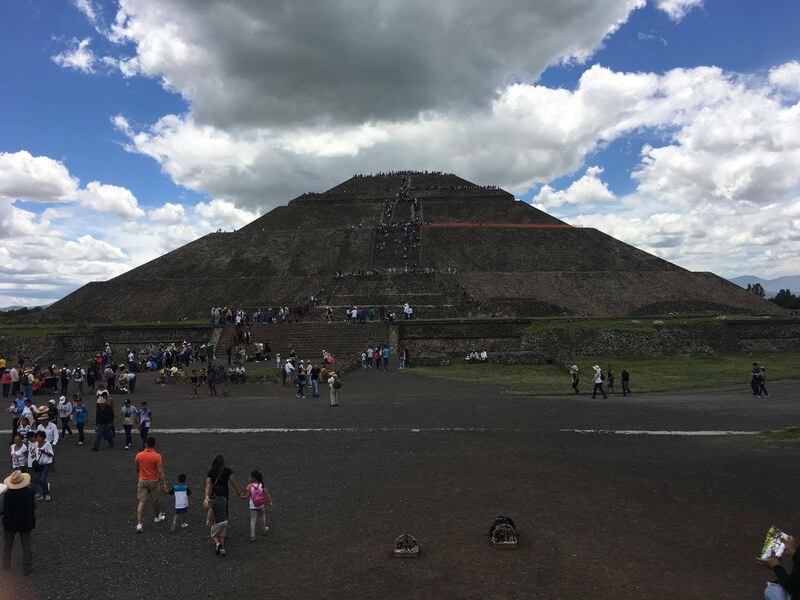 Once we arrived, I was super excited to climb the pyramids, until I actually saw one. They are so small y’all and the steps are so steep! Just getting to the other side of the pyramid was tiring. We met a very nice vendor who was selling a Sun God and a Moon God musical instrument that doubled as a pottery piece. When he found out it was my birthday and that we were Spanish Teachers he asked us to record something for him, which we did. In the recording, he explained what music was played for each God. He then played happy birthday using the Sun God and it was great. I obviously had to buy it! Raquel tried to climb the pyramid, which I refused because I am terrified of heights and there were way too many people going up and down. I decided to sit on one of the smaller pyramids and just take everything in. The beauty and the hard work that so many Aztecs put into building these wonderful pyramids. My mind couldn’t help but wonder how different life was for them. Raquel could only get halfway through the Sun pyramid before coming down. You have to be super fit for those pyramids! It is said that if you wear white to the pyramids, you will be filled with positive energy, so I did. Hey, I’m a teacher, I’ll take any positive energy I can get! After spending about 3 hours in the pyramids we headed back and had dinner with Maricela and Gabriel. We all rested from the long day and then night time hit, we decided to go to the monument of the revolution also known as “El Monumento de la revolución.” This also lights up at night and has a museum inside. The price varies on the type of tour you take. We went at night time so the museum was closed. You can take an elevator up but not down. Once we got to the top, I panicked. I hadn’t realized how tall it was going to be. Once again, I’m terrified of heights!!! Luckily, Raquel and Maricela were with me the entire time and I can’t deny that the view from the top was breathtaking. It took me a while to make it down the stairs, but once I did I went straight to the gift shop! I bought Linda and Jarrett shirts that were among the most famous revolutionaries in Mexico, Emiliano Zapata and Francisco Villa. My birthday ended with a tour around the Mariachi Plaza, which is where many Mariachi groups are and people can just drive by and hire them. This area isn’t very safe, so if it’s not early at night, I would avoid it. Lastly, instead of birthday cake, I had birthday churros from a great place, which sadly I don’t know the name of, but they were delicious!!! Sunday, we went to a market called “Mercado de artesanía” where they sold so many great things! I wanted to but everything I saw! I purchased an embroidered Mexican peasant shirt and some pure silver earrings with a real turquoise stone in them. Raquel purchased a beautiful chess set for her dad that was made of stone. We walked around for hours and that was it. On Monday we had a few hours to kill before our flight, so we decided to tour Mexico City’s most popular wax museum and they had celebrities from all over the world. From Michael Jackson to the Queen of England. My favorite would have to be a tie between Pedro Infante and Alejandro Fernandez. Yes, I did fangirl when I found their wax figures. Judge me, I don’t care. We returned to our air bnb and said our goodbyes to Roo and Maricela. Gabriel drove us to the airport and so at last we said goodbye to him. I never truly realized how beautiful Mexico City was until I spent 6 days there. It was the trip of a lifetime and I can’t wait to go back! Raquel and I are already planning our trip to Cancun next summer! Thanks for reading all about our trip! I would like to thank Dr. Miranda Recinos and her family for their hospitality during our time in Mexico City. I’ve adopted Maricela and Gabriel as my third set of grandparents. My heart goes out to all the people affected by the earthquakes that have affected Mexico recently, but if it there is one thing I learned on my trip, is that the people of Mexico are resilient and fighters. Lastly, I’d just like to say how much this trip helped me get a better understanding of my culture and who I am. I’ve always known I was Mexican-American and traveled to different parts of Mexico, but I was never old or mature enough to understand everything I was looking at. This is the first trip I make to Mexico with an opened mind and heart. By doing so, my heritage has become my biggest pride. I love being Latinx and everything it entails. Thank you México city for helping me understand a side of me I didn’t even know was misunderstood. Thanks for the write up Michelle! It sounds like an amazing adventure and I'm incredibly jealous. Me too! If only we could go visit... Hopefully one day we will.